Sweet and well-written, hit all the right notes. The teacher-kink dynamic was just enough to be hot without being weird and I liked the power dynamic. I enjoyed that the difference in ages was apparent through their approaches to life, but it wasn't focused on. I had a hard time connecting with Sebastian at times, as he often let his intellectual side get away from him, but the way he and Tristan balanced each other out was nice. I always have a hard time with stories in which one partner struggles with the other being in the closet, but I liked the way it was handled so everything was still Tristan's choice. I also enjoyed the way Sebastian's ethnicity played a role in the story without being the focus. It's always fun for me to try to figure out who the rest of the books in a series will be about and I'll definitely be checking them out. 4-4.5 stars If someone had told me all of the tropes and extras that were going to be in this book, I would have said that it had to be a mess, because no way could it all work. I would have been wrong. There’s student/teacher, closeted pro athlete, some mild kink, and age gap just to name a few. It’s not very angsty, the relationship is the central focus, and some outside forces impact it, but are fairly quickly resolved. Sebastian and Tristan were both really well developed, with great banter and dialogue. The secondary cast of characters was amazing, and nicely sets up the next books (which I am so excited for). There were some minor things that didn’t work for me, but it was completely personal preference. I voluntarily reviewed an advanced reader’s copy. 4.5 Stars I really, really LOVED this story. Tristan Holt has decided to take a few college classes during the NHL's off season. When he can't get his sociology professor, Sebastian Cruz, out of his head, he decides to make a move and ask him out the day the semester ends. Sebastian is trying to get tenure at the University and he's got it bad for a student. How bad would it be to start seeing each other after class is officially over? It probably won't last anyway... I totally dug the whole Hot For Teacher aspect, as well as the age gap. I loved every part of Tristan. I loved how he stood up for himself when accused of cheating. I loved how worried he was about his professor's feelings. I loved how much he was embarrassed to express what he needed from Seb but did it anyway. He was a great teammate. He cared about his game and his team and his friends and loved his family. I loved how emotional he got over missing Thanksgiving with them. I grew to love Seb at the end. I think if he wasn't such a complete jerk at the start I would have given this a full five stars, but I was turned off on his character until the very end when I felt he finally showed some real emotion. This was a great writing partnership between Avon Gale and Piper Vaughn. 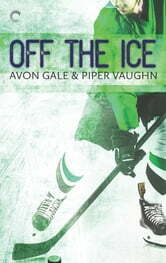 I have thoroughly enjoyed Gale's previous hockey books and this was right up there. A must read!